There’s no doubt about it, this was one solid bike that I opted to test out for a week. 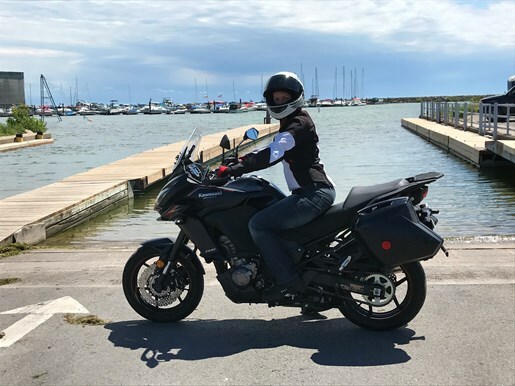 I suppose I was up for a challenge, and while the bike itself was an easy ride, navigating it around Ontario’s Southwest certainly tested my limits as a rider. 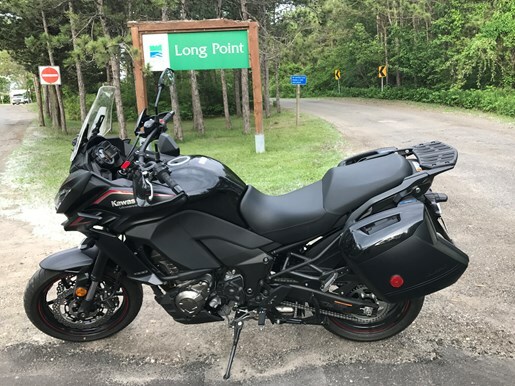 I subjected this bike to a lot of different conditions throughout the week, including a solid five-hour highway ride from Niagara Falls to Windsor, Ontario, and then a tour along the Lake Erie coastline. I was grateful to be decked out in my Joe Rocket helmet, jacket and Kevlar jeans. One thing is for certain, this bike is comfortable and is the ultimate long distance two-wheeled machine for riding anywhere in Ontario. 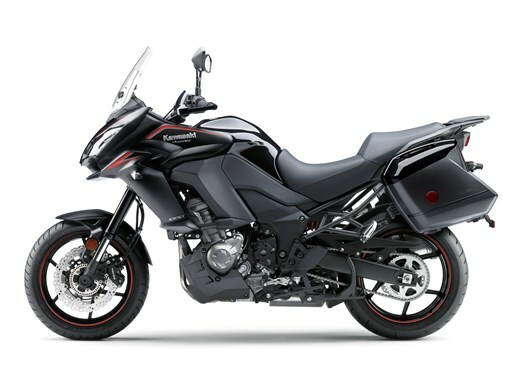 The Kawasaki Versys derives its name from the term “versatile,” and takes pride on its ability to offer riders a combination of sport touring, cruiser, and sportbike, wrapped up into one nice package. The bike offers its rider simplicity in terms of style and functionality; and balances this with exceptional power and handling on the road. 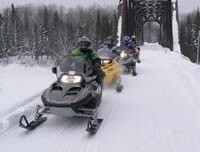 Who needs heated hand grips or cruise control when you have a 1043cc inline four-cylinder engine that produces around 120 hp of pure fun?! The Versys 1000 ABS LT offers excellent low to mid-range RPM. At a maximum power of 9,000 rpm, and maximum torque of 7,500 rpm, this bike had no difficulties keeping up with my sportbike riding buddies on back country roads. 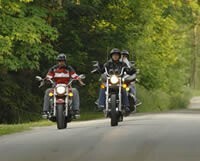 The bike was peppy, and with the quick twist of the throttle I was able to get around slow-moving vehicles or unsafe situations on the highway with ease. 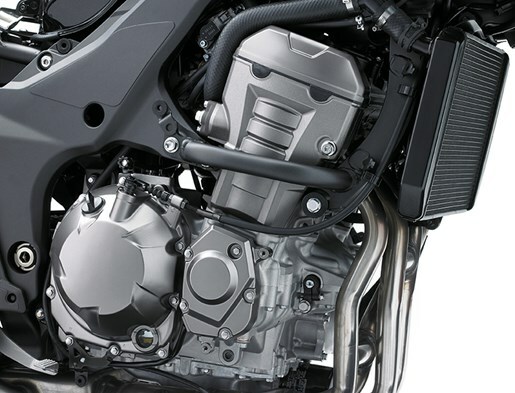 The dual throttle valves on each cylinder regulates air flow, and offers the rider consistent and powerful performance. 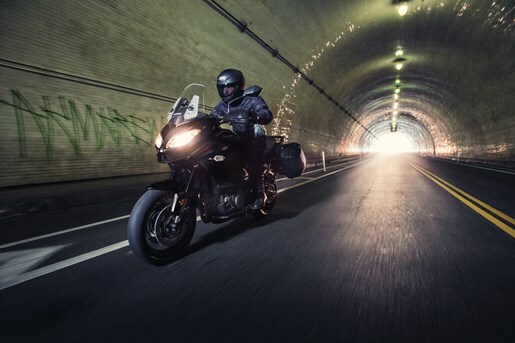 With a 6-speed transmission, the Versys offers smooth and linear shifting each and every time I shifted. Combine effortless shifting with a gear selector on the instrument panel, and you have an incredibly easy and forgiving bike to ride. Kawasaki boasts about how nimble this bike is; meaning it is quick, light, and agile while on the road. I would agree with this assertion. While the bike was heavy and difficult to move around on two feet, it was surprisingly light and fun to ride. I found I was able to get into some fun corners and twisty roads using the high power mode, and although the wider frame and handlebars prevented me from getting low into those corners, I still had a good time while navigating corners at a quick pace. 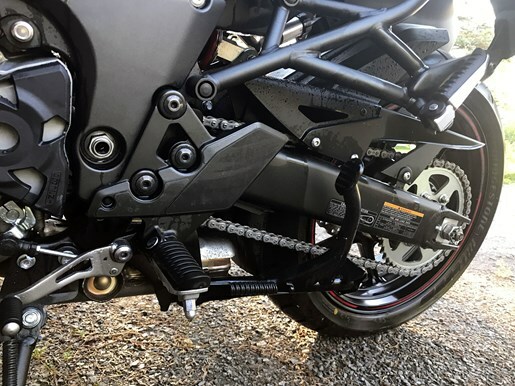 In blending the barrier between sportbike and touring bike, the assist and slipper clutch, combined with a three-step traction control system and ABS, make this a safe bike that can handle all weather and riding conditions. Gravel in a road corner, or wet roads, were no problem on this bike, which also features a low power mode that can be used in these situations. At 569 lbs including saddle bags and other add-ons, this bike is one of the heavier sport-touring bikes I’ve tested. In addition, at 55.1” tall, a seat height of 33.1”, and width of 40.4”, the bike is not for a small or shorter person regardless of gender. With my 5’7” tall frame, I found the bike difficult at times to move around due to its sheer size and width. 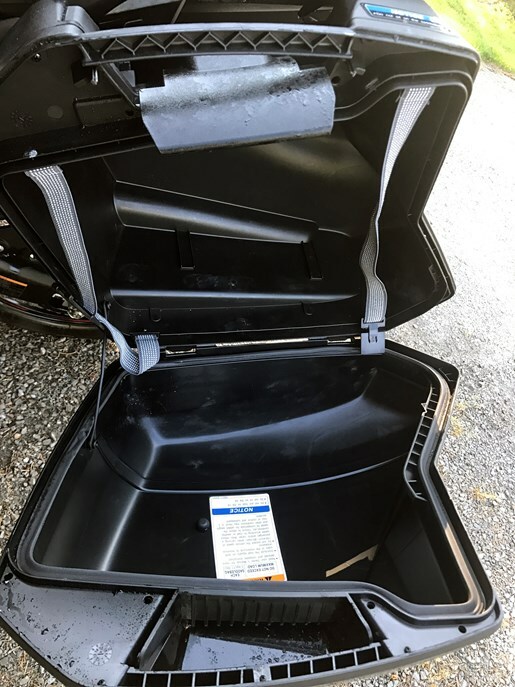 The easily adjustable preload settings can help with this a bit; however, it’s worth repeating that this is not the type of bike for a shorter, smaller-statured rider. After a few days on this bike, I got used to its wider frame and wide seating position (which initially gave me sore shoulders and a sore posterior). After my body adapted, I found the bike pretty comfortable especially during the long distance rides I took it on. 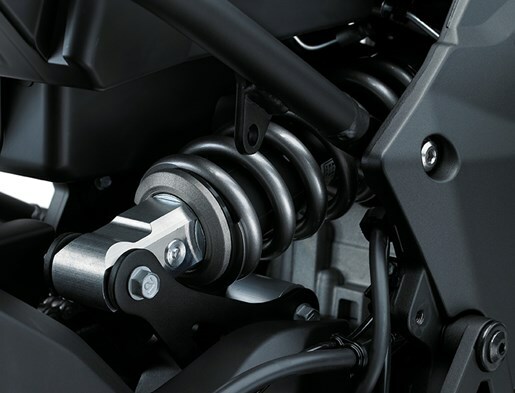 The upright sitting position, and both front and rear spring preload adjustability, inverted front fork, plus horizontal back-link rear suspension, allows its rider to cruise for long periods of time with ultimate comfort. I found that the suspension easily supported my weight over bumps on the road (and I definitely hit some serious bumps over railroad tracks), but the machine never bottomed out and was able to maintain its stability over these rougher road conditions. This fairly low-tech bike still has many features that are desired for the ultimate adventure touring motorcycle rider. Its manually adjustable tool-free windscreen is easy to raise or lower with the quick turn of two knobs on the front. 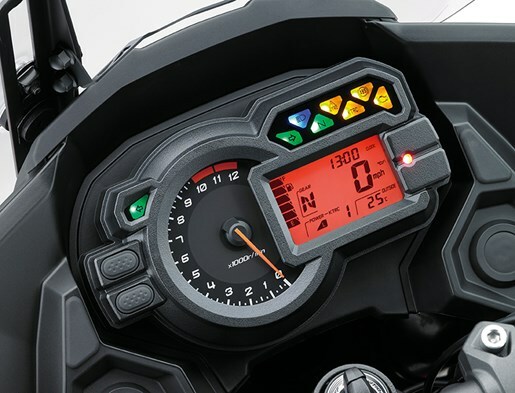 It comes with a centre stand, which makes maintenance and changing oil a breeze, and the instrument panel is simple, yet has all of the pertinent information one needs while riding. Add spacious saddlebags and an ECO indicator for reduced fuel consumption, and you’re laughing at how easy this bike is to ride on both short and long-distance rides. Some riders asked me how the ECO mode affected riding performance, or whether it had any impact on power output. To be honest, I barely noticed that the ECO mode was engaged when I was riding, aside from a light on the instrument panel telling me it was engaged. So, I guess the answer to that question is, no, I did not notice a difference in power. I did notice that the fuel consumption was minimal, and that this was an incredibly efficient bike that travelled over 300 km on a single tank of fuel. Kawasaki has skillfully designed the Versys with features that are similar to a sportbike, making it a sharp-looking bike. The larger-sized tires, minimal body work, and simple metallic flat black colour caution riders and onlookers that there is much more beneath the surface. At times I had people gathered around the bike in parking lots to give this bike a second look. With a growing number of adventure touring riders, and the desire to ride further, faster, and experience more that life has to offer, comes the need for a motorcycle that meets this demand. The Versys 1000 ABS LT is a strong, solid bike that does just that. Originally introduced in 2015, this bike has consistently offered riders lots of power, combined with smooth handling, quick maneuvering, and ultimate rider comfort. The height, weight, and width of this bike are more than what the average-height rider may expect though, and so a solid test ride is encouraged to determine if this is the right bike for you.